Four years of pushing my mind and body to its limit, being one piece of a pyramid that would crumble figuratively and literally if I didn’t do my job, trying to motivate and support teammates to do what may seem like the impossible. The sport of cheerleading is not one for the light-hearted. It’s for the tough, strong-minded, internally & externally motivated, ok with failure, smile through the pain individuals who see the end goal and do everything they can to get there as a team. I fell in love with this sport eight years ago and it has a large hand into why I am who I am and why I am the leader I am. Yet, this year was the year my leadership was pushed to new levels and my personal motivation was tested and retested. This year I walked into the gym as a four-year program cheerleader (not a small feat) and was elected as the captain of the All-Girl team. As the captain, I was not only the one everyone looked to when they didn’t know what was going on but as the one to make the final call of to stand up for their wellbeing. I was also as the person my coach leaned onto be the liaison between him and the team. It was a position that I knew I was ready for but never thought would challenge me so much. The team of girls this year were comprised of me, the fourth year, a few third years, and a TON of rookies. The rookies dominated in numbers and were (and still are) unbelievably talented. I knew that the rookies would be fragile as they learn the ropes. 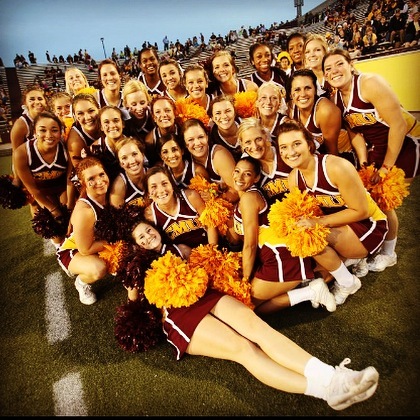 I knew if we did it right, we could hone in on their talent and push them to reach skills our CMU Cheer Program has never seen before. Knowing that all I could think about is “How am I going to do tha?t!” My initial mindset was a micromanaging strategy talking to them about what motivates them, making sure the older teammates knew not to be mean and run them off the team and to encourage them even when they fail and so on and so on. Obviously, that isn’t the best way. There is no way for me to control what happens and I obviously can’t make someone stay if they don’t want and even more so I don’t want the older girls to be anyone but themselves. We had to build a family filled with trust, motivation and a goal. That doesn’t happen overnight and there isn’t a handbook telling us what to do for a reason. I decided if I clearly communicated my goals for myself personally and highly encourage them to set personal goals, then to set goals as a team would be a good first step. From there I was clear about the role I wanted and planned to play and communicated the leader I wanted to be for them. I told them I will be the arms to catch them when they fall, someone, they can trust no matter what and someone who will always have their best interest in mind, but I will also push them and communicate to them with as much transparency and clarity as possible. I came into practice every time and did my 110% best to be the leader that I told them I would be and some days it was really hard and I failed a few times when I started to let the weight of outside sources come inside the gym. For that, I was called out that, which was a good thing. My team knew when I was off my game gave me the support when I needed it. That understanding helped build a trust that was unbelievable. These girls trusted me to convince them to do stunts that they didn’t think they could do. They followed suit and each individual was transparent with the rest of the team about what they could offer and over time built a bond of 30 women that was like none I have ever experienced. Of course, there were bad days and of course, I didn’t do it alone, but it was a perfect storm. 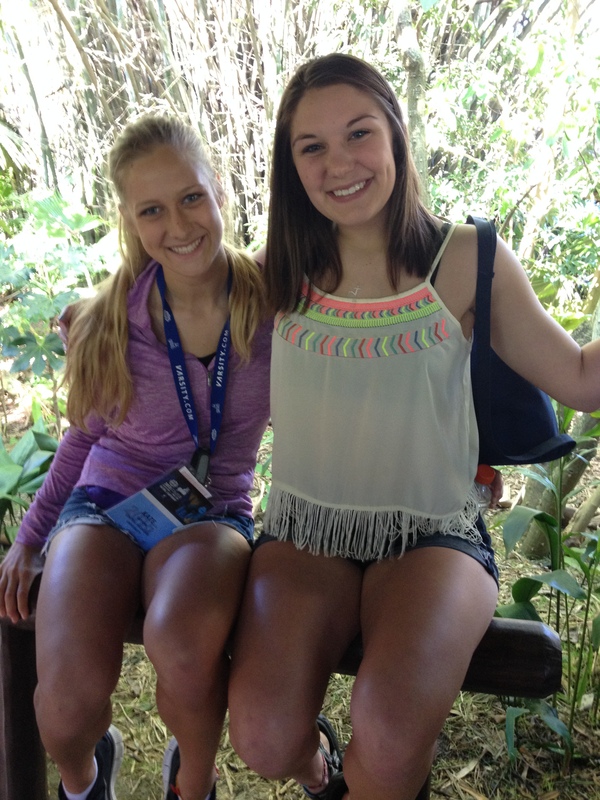 We may not have all been best friends but the bond we made will never be broken. Through injuries and routine changes to adding in the most difficult skills, we have EVER done the night before National Finals. 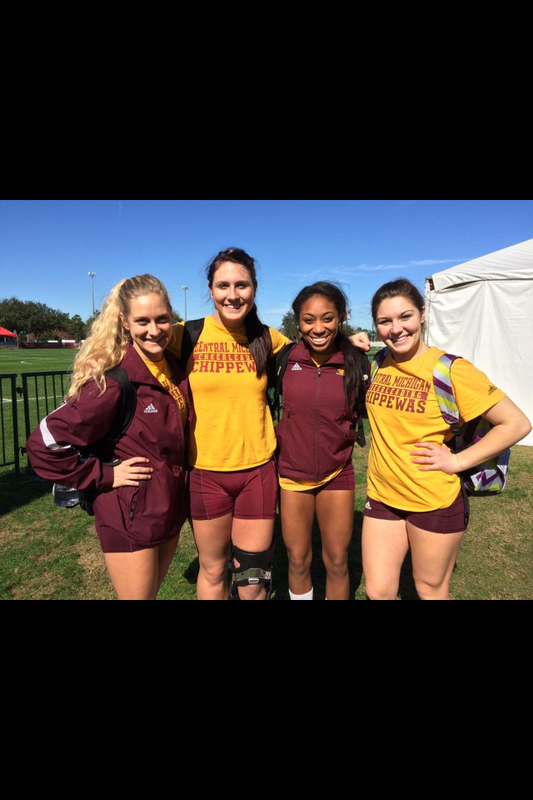 Through tears, blood, and college life we hit the mat and made CMU History in so many ways. I learned that as a leader you don’t always have to have it all together and everything happens for a reason. When building a team if you come in and say, “this is who I am and this is what I will be doing to make our goals happen, what do you plan to do to help? We can do this together!” is a great place to start, but to actually do what you say builds a loyalty and trust that can launch girls high into the air (no pun intended). 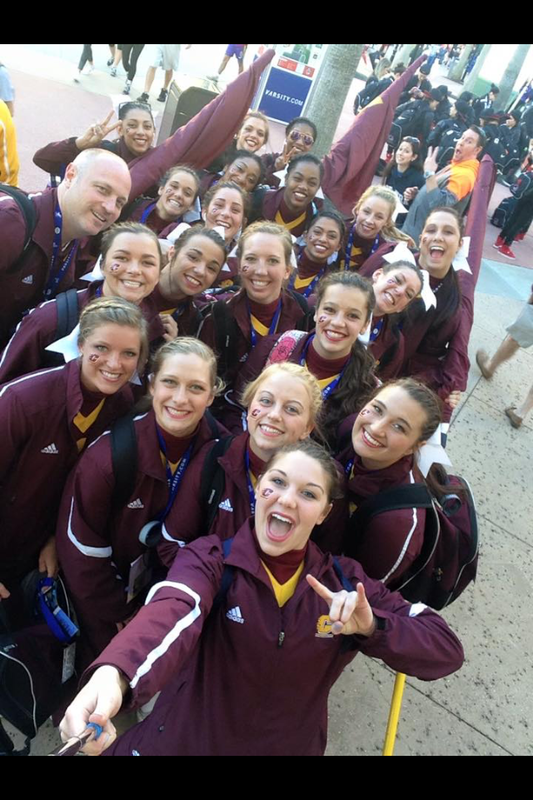 Central Michigan University 2017/2018 Competitive Cheer Team Takes 10th in the toughest division in the Nation. I can leave the program knowing that I had a journey of a lifetime, but I’m leaving it with a standard that I helped set with talented athletes who will make me proud. 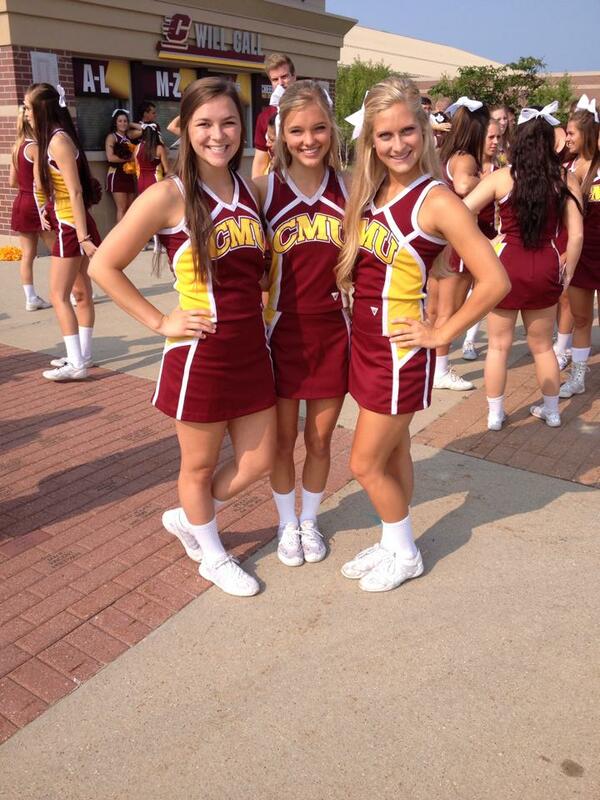 As a CMU Cheerleader it is a great privilege. It takes a lot of hard work dedication and the ability to push yourself to a level you thought you could never reach. I already tried to write this blog once before and it was LONG way too long. I talked about my whole entire journey from the start to finish. I talked about the highs and the lows and the in between. It turned out to be more of a vent journal entry and I didn’t believe it embodied all I wanted to say about my experience. So I decided to sit on it for a while and have some time to even wrap my head around what I actually did to myself with my team for the past year or so. This past weekend I sat through the most beautiful 5 hour banquet that embodied the exact experience I wanted to share to all of you. Our cheer banquet highlighted MVP’s, Rookies of the Year, Spirit Awards, seniors, and our journey through nationals. We reflected all together why we do this crazy sport and put of minds and bodies though this. 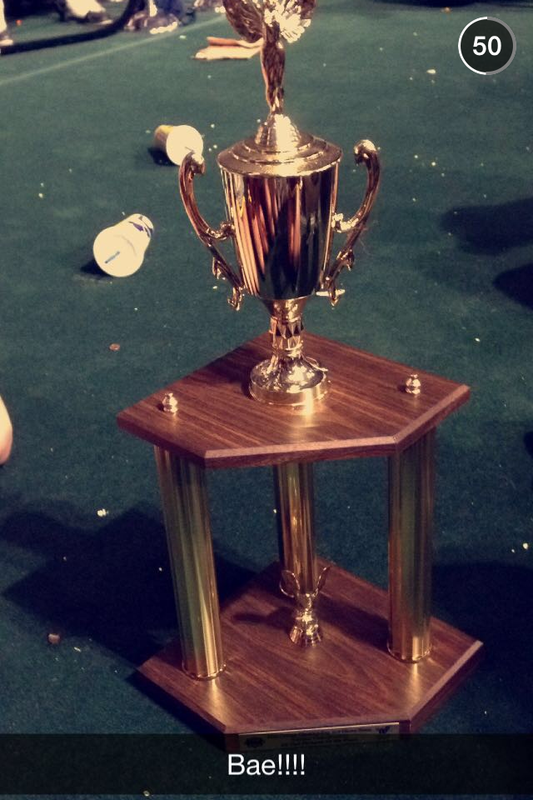 It’s because we love challenge, we love cheering for a school that we love more than anything, we build trust with one another that is unbreakable and we work for a single moment of 3 minutes on the national’s mat that gives you the feeling if you bottled up could power a whole city for a week or more! We become a family that will stand by your side through anything and will always be there. This crazy sport of cheer teaches you self-worth, confidence, how usually the only person standing in your own way is yourself, to reach for the stars even if you land on the moon, set goals and run after them with all you have, find passion, determination, love. Embrace pain, frustrating, let down, anger, nerves, emotions. Take it alllllll in and use it not just in cheer but your everyday life. Cheer makes you strong physically and mentally but getting there is a journey that you have to trust. We start by seeing if we even make the nationals team. Myself I didn’t, I was an alternate so I would go to all the practices learn anything I could and get thrown in if anyone got hurt. It was stressful, there was no way to really prepare you for the text you get form coach saying today you’re going in. That first practice was a nightmare. I ran around the mat like a chicken with my head cut off. Trying to listen to directions of where I was supposed to go, I was excited but was terrified. Especially being thrown into a group with a vet 4th year (2 year cheering or more) flyer. With me coming in she had all rookies underneath her. She wasn’t happy and I was scared, intimidated and wanted to cry. Trying to find a group of 4 girls who mesh with each other to make a stunt group (a stressful period for any rookie) is a big process but being thrown into a group that doesn’t seem to want you, there is no words to describe. That is where my journey started officially. My group trained and trained and pushed through pain and struggle. Turning out to be one of the most elite and consistent groups on the team–front and center. I was pushed to levels I never thought could be at physically and mentally. I pushed through my flyer and back spot getting hurt 2 weeks before nationals. My base and I forming a bond that will never sever. Together physically and emotionally had to go through a week and a half I wish I could forget. To them coming back and putting on a show of a life time. Taking 5th in nation in semi’s to 9th in the nation over all out of 20+ teams. A place the CMU All Girl Cheer hasn’t been at in years. It made every hour in the gym worth it. Every hit to the face, bump, bruise, tear, frustration and feeling like it wasn’t possible worth it. 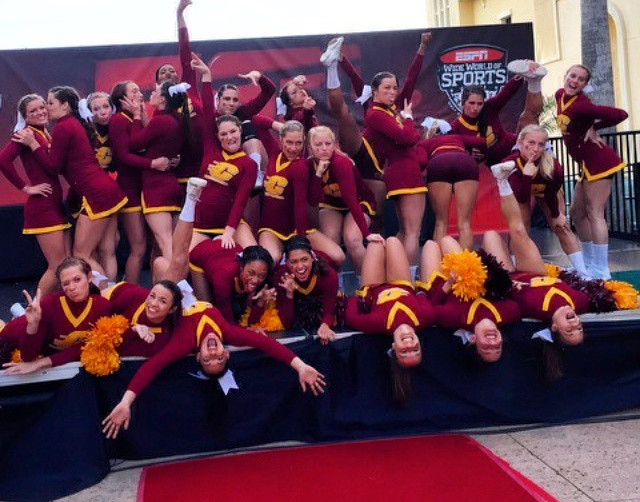 We made CMU Cheer history by taking both and All-Girl team (Me) and a Large Coed team to nationals and both making it to finals. 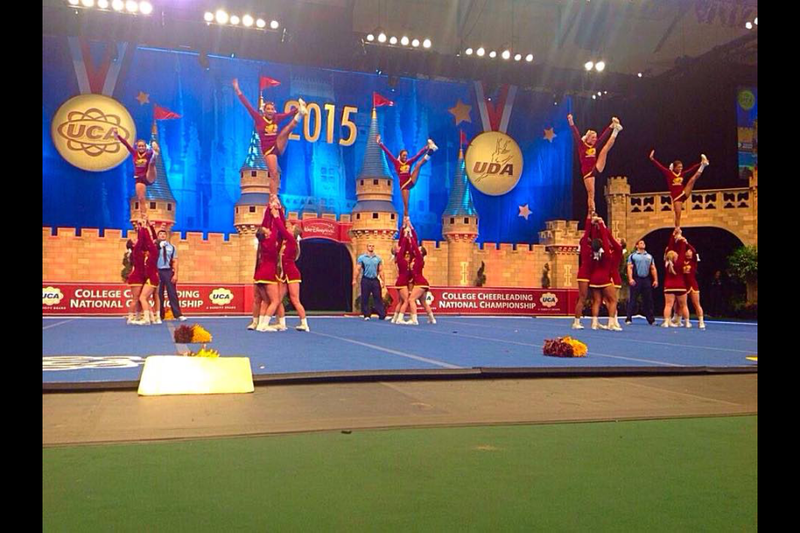 We are now one of the top 40 schools to cheer at in the nation. I am a part of the family that all together wants to make this program and themselves better. I get to be a part of the start of huge pivotal changes in this program and wouldn’t change it for the world. I am and always will be a better person from this experience and I thank my coaches and this team for that. 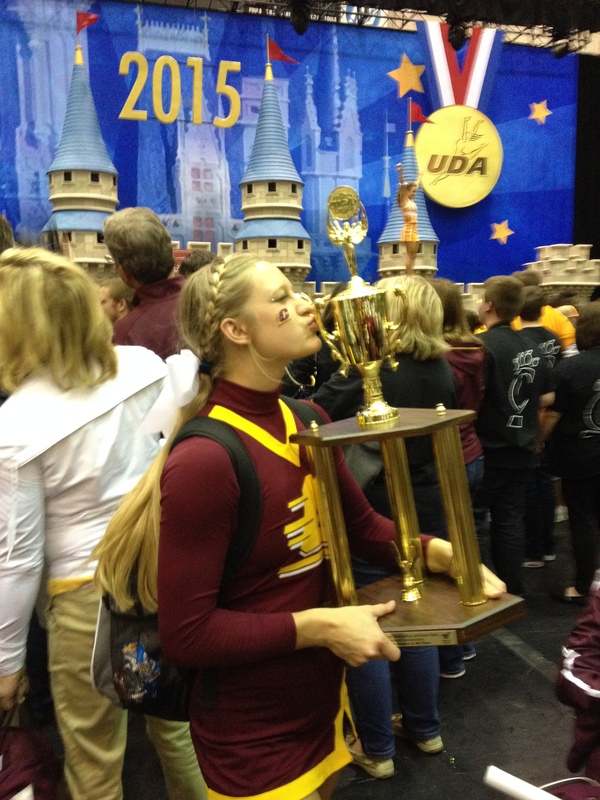 I bleed maroon and gold, CMU Cheer and everything this program stands for. 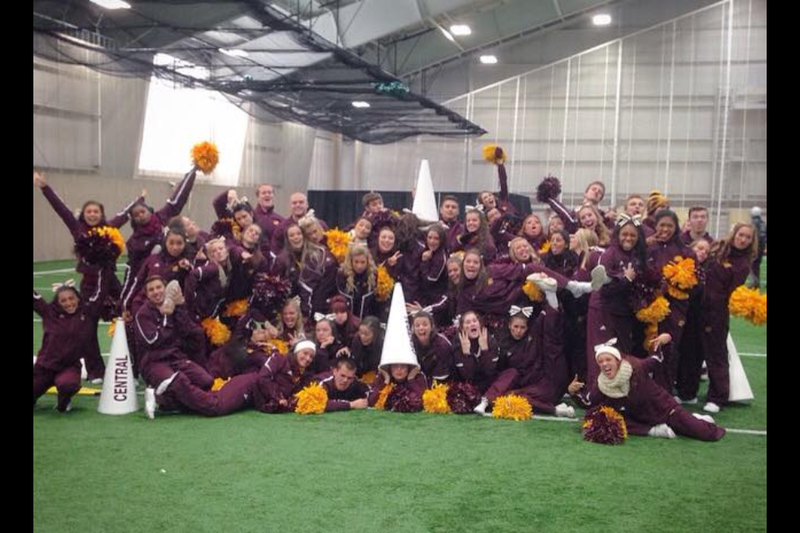 FIRE UP CHIPS!! !